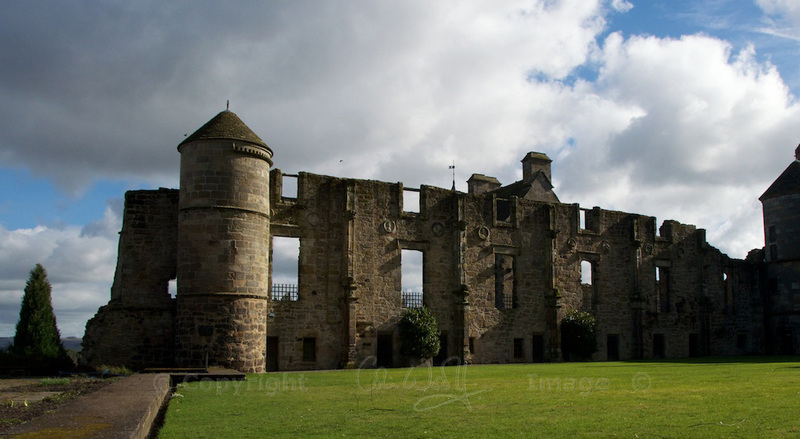 In 1542, James V of Scotland lay dying in Falkland Palace. He was still only 30, but he had lived a full and rather stressful life. 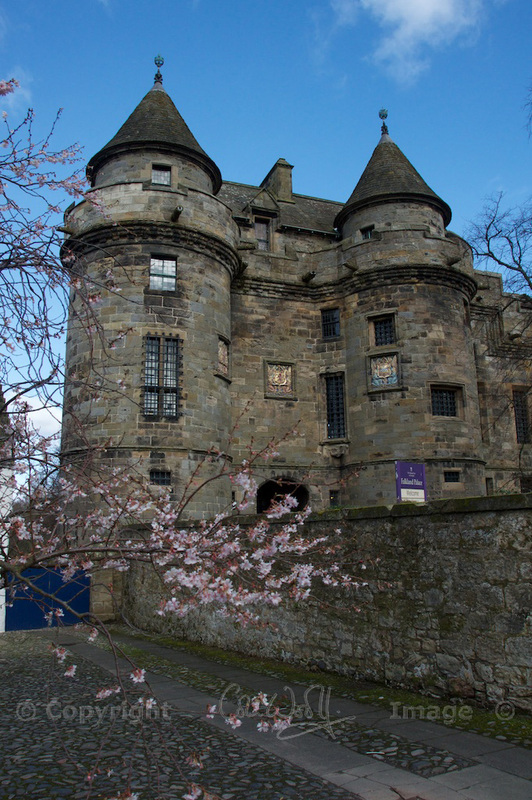 The son of the tempestuous Margaret Tudor, he’d been held captive here for two years by his stepfather, he had sired at least seven illegitimate children, and his first wife, Madeleine of France, had died in his arms only weeks after arriving in Edinburgh. Now, as he lay ill with a fever, his second wife, Mary of Guise, was giving birth to a child in nearby Linlithgow Palace. They had already lost two infant boys, and another son was dearly hoped for. What he meant was that the Scottish crown had passed into his family centuries before, through the daughter of Robert the Bruce; and he feared that his own daughter would be the last of the Stewarts to wear it. Six days later, James died. He never saw his baby daughter, Mary, who was now Queen of Scots. 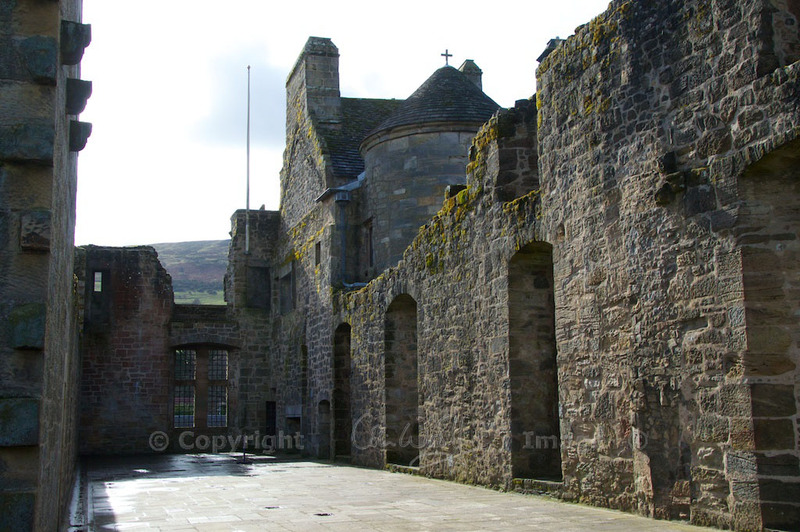 Falkland didn’t begin its life as an opulent palace, although that is certainly how it ended up. The original castle, which is thought to have been built sometime in the 13th or 14th century, belonged to the Earls of Fife; but in 1425 James I confiscated the estate because he suspected the Earl of plotting against him. 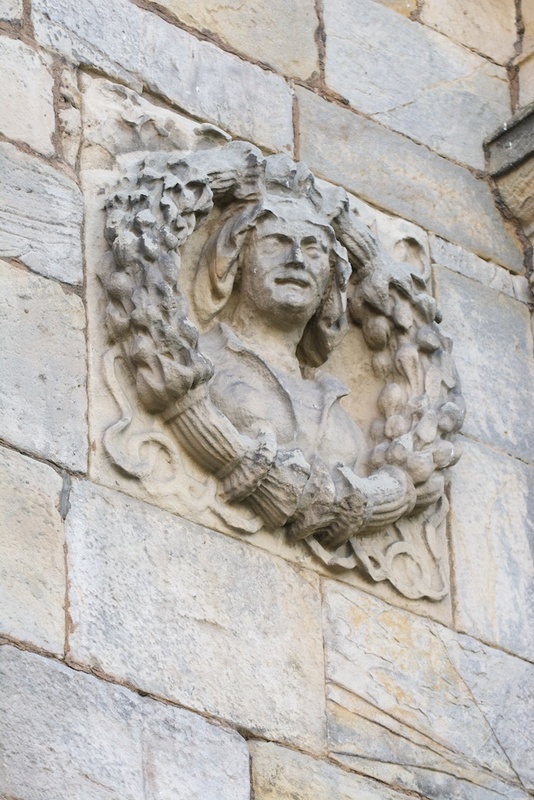 James’ son, James II, adopted the castle as a royal residence for himself and his queen, Mary of Gueldres, and he raised the village of Falkland to the status of Royal Burgh. But it was James’ descendants, James IV and then his son, James V, who had the biggest ideas about Falkland. Using the master mason who had worked on Stirling Castle, James IV designed an impressive new palace in the form of a quadrangle, and work started in the early 1500s. Then life – or, rather, death – got in the way. In 1513 James was killed on Flodden Field, leaving an infant son as as his heir. 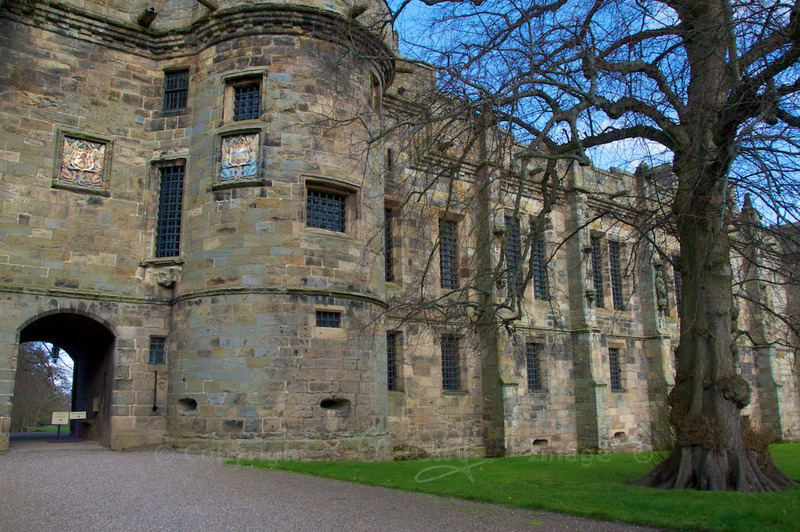 James V had suffered a troubled childhood, but when he was old enough to grasp the reins of his kingdom he made sure that Falkland Palace was completed in the most opulent Renaissance style. Stone was quarried in the nearby Lomond Hills; timber from Sweden and Denmark was shipped to the port of Leith and then towed in rafts across the Firth of Forth; and skilled craftsmen came from France to do the fine plasterwork. 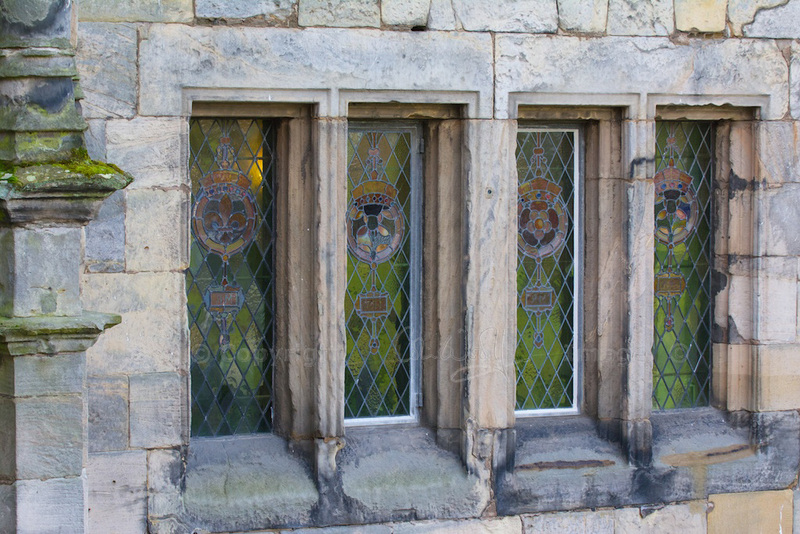 Despite the high cost of glass, there were glazed windows throughout – even in the kitchens and bakehouse. 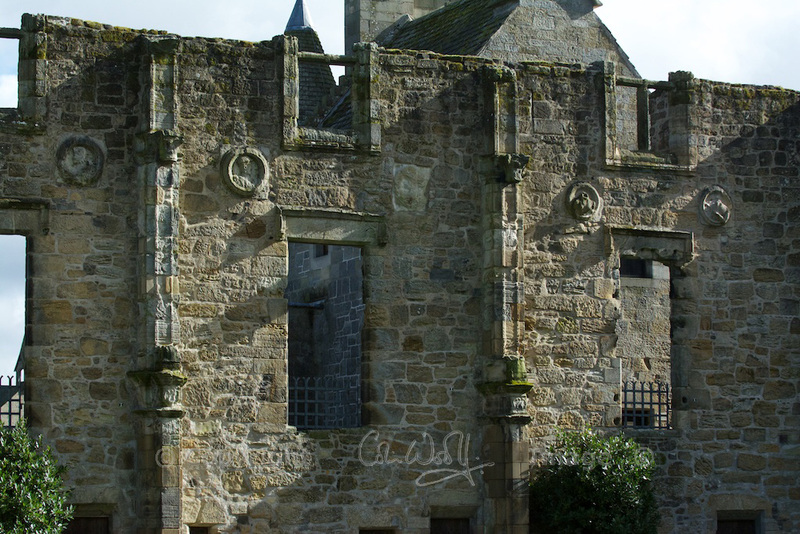 With his second wife, Mary of Guise, James held court here, filling the rooms with scholars, playwrights and musicians; French and Italian minstrels would sing, and poets composed eulogies on the beauty of their surroundings. Between August and October, hunting parties would ride out in pursuit of deer and wild boar, and a team of falconers provided birds for hawking. Falkland was vibrant with life. For so much luxury and so much indulgence, there was obviously a high price to pay. 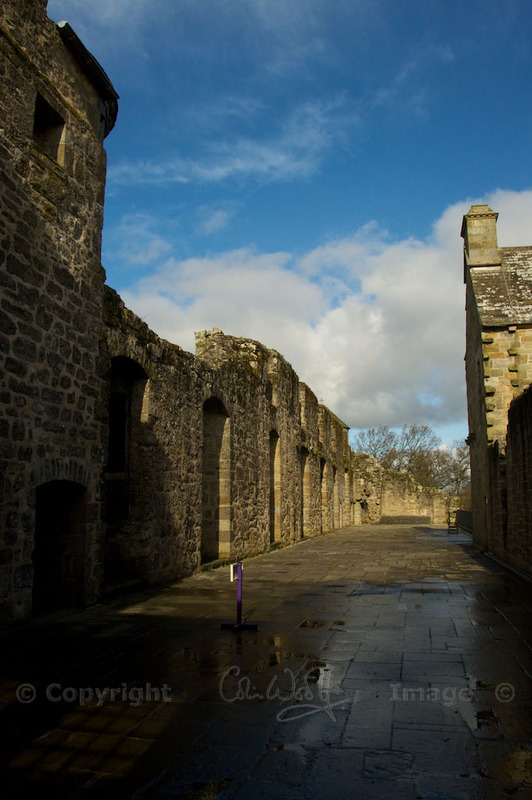 James and Mary had already suffered the loss of two infant sons when, in 1542, James retired to Falkland in a bleak state of illness and depression. He had just been defeated at Solway Moss, having taken up arms against his uncle, Henry VIII; and he was sinking into despair. Even the news of his daughter’s birth couldn’t revive him. So Falkland bore witness to the King’s body, lying in state before it was transported across the Firth of Forth to Holyrood Abbey. The main object now was to keep Mary safe from the acquisitive eyes of Henry VIII, and at the age of six she was sent to marry Francis, the Dauphin of France. But as we know, that was only the beginning… and Mary returned to Scotland in 1561. She was now a widow, and a very eligible one – but she had time to enjoy the sport that Falkland had to offer. She was keen on deer hunting and falconry, and she played ‘real‘ or royal tennis on the court that was built for her father, and is still in the gardens. Mary’s son, James VI, was perhaps the last monarch to fully appreciate the delights of Falkland, but for James a twist of fate drew him to a new land and a new throne – that of England, where the centre of his combined kingdom lay in Westminster, far from the hills of Fife. After that, Falkland was administered by specially appointed Keepers, and the last monarch to stay here was Charles II in 1651. Charles had just been crowned King of Scotland, but things weren’t going well for him, to say the least. His father had just been executed, and Royalist support was waning. To save his own head, Charles had no choice but to flee abroad. Meanwhile, at Falkland Palace, Cromwellian troops were rolling up at the door. The ruin of so many of Scotland’s lovely castles can be explained by the apparent carelessness of departing soldiers and an afterthought along the lines of “Oops, we forgot to put the fire out.” When Cromwell’s troops packed their bags a couple of years later, the blaze from an “untended cooking pot” ravaged the north range and the royal apartments. What a loss. James V’s beautiful palace now entered a long phase of decline. Luckily for us, it was saved from total dereliction in the 19th and 20th centuries by a series of owners who still bear the title ‘Keeper of the Royal Palace’. In the late 1800s the 3rd Marquess of Bute, John Patrick Crichton-Stuart, embarked on an ambitious restoration project in partnership with John Kinross, a leading Arts & Crafts architect. A further contribution was made by John’s grandson, Michael Crichton-Stewart, who re-roofed the south range and restored the painted ceiling of the Chapel Royal. 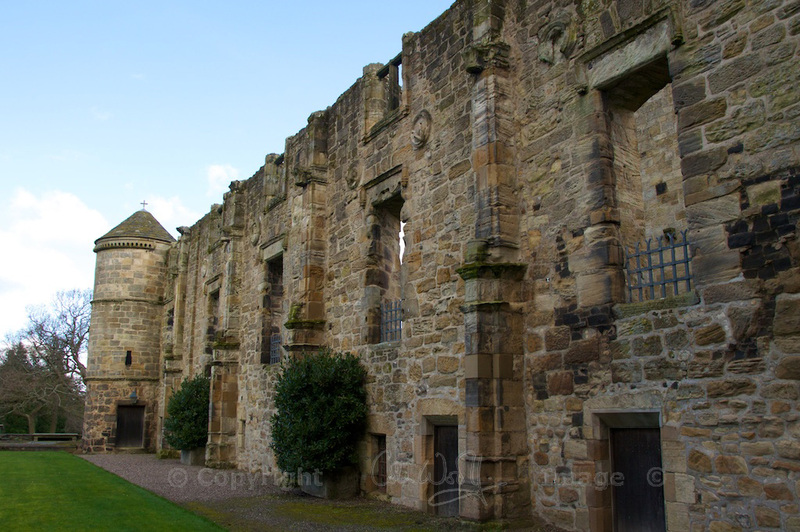 Falkland Palace is now maintained by the National Trust for Scotland. The Crichton-Stewart family are still hereditary Keepers, and continue to use part of the property as their family home. Standing right on the main street of the pretty village that bears its name, Falkland Palace is fiendishly difficult to photograph from the road, but that aspect of its situation obviously didn’t bother the Stewart kings. You enter the Palace through a big wooden door in the south range, and as you gaze up at the turrets with their gilded crests you suddenly feel the need for a heavy sweeping train and an ermine cloak. When we visited in March 2014, the Palace had only just re-opened for the new season, and we had it pretty much to ourselves. Although much of the interior decoration has been done afresh by the Marquess of Bute, many of the furnishings are original and contemporary with the Stewarts’ reign. Oak panelling adds depth to shadows; the eyes of life-size portraits follow you silently down tapestried galleries, and your footsteps echo on stone stairs. National Trust volunteers are on hand to offer detailed answers to your questions, and to fill you in about the purpose and history of each room. If you can mentally strip away the paraphernalia and home comforts of the late Victorians, you can glimpse the chambers as they appeared over 500 years ago, when they were inhabited by the lords and ladies of the court. The royal apartments still stand as a roofless ruin, but next to them a fully restored section has been beautifully furnished to resemble the king’s and queen’s bedchambers. Catholic worship still continues at the Chapel Royal, where James V lay in state and where, in 1561, his daughter reputedly washed the feet of 19 virgins – one for each year of her reign. We respected the National Trust’s policy of no internal photographs, although the ladies on the front desk needed some convincing that Colin, bristling as usual with his panoply of lenses, wasn’t up to no good. Once we were back outside, we took advantage of the weak spring sun as it shone briefly on the Palace before disappearing behind the Lomond Hills. In the gardens, a team of volunteers were starting work on the herbaceous borders; the lawns were studded with brilliant gold and purple crocus, which really demanded a photo or two. While Colin was on his hands and knees looking at crocuses, I followed a sign to the ‘real’ or ‘royal’ tennis court and disappeared. If you’d like to know more about my adventure, you can read about it in this feature! 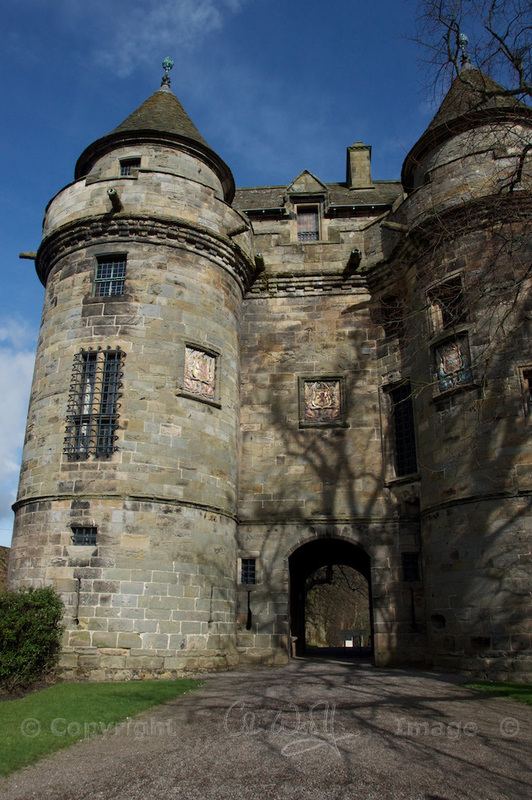 Falkland Palace lies about 40 miles north of Edinburgh, in the Kingdom of Fife. It is open from 1st March until 31st October, from 11 am until 5 pm. There is an admission charge, although National Trust for Scotland members and volunteers can enjoy free entry. You can also take a brilliant ‘virtual tour’ via the Trust’s website, by following this link. My thanks to the National Trust for Scotland who kindly permitted me to use some of their internal photos. Awesome Jo! What a palace. I know, Susan, and I’m glad you enjoyed it! It’s interesting to see how time has treated Linlithgow, Stirling and Falkland – each appears so different now, although both James IV and V had a hand in all. We’re so lucky, Lynne – so many castles within easy reach. I was pretty excited to see this one. 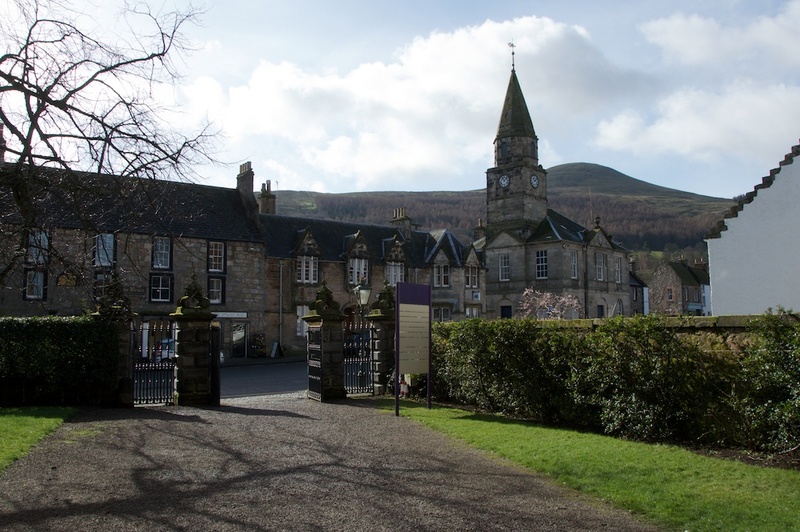 You’d love the whole village of Falkland, it’s like stepping back in time, and it has an elegant looking church. James V was still young to die at that age, I think – although the dangers of warfare (and childbirth, for women) kept life expectancy pretty low. Historians are still not really sure what exactly he died of. You’ve left us a nice cliffhanger there, I wonder what you got up to at the tennis court… It’s a pity you’re not allowed to take photos inside, as with so many historic buildings, and I know what you mean about photographing from the outside – impossible to get a shot from the front with no cars in it. I enjoyed reading the history in this post, a little of which was familiar from previous visits. Looking forward to part 2! Haha, I can’t wait to tell you about it! 🙂 Yes, I know – I was a bit disappointed that I couldn’t take photos inside to begin with, but then you realise that it’s still very much furnished as a family home, rather than, say, Stirling Castle which is very sparsely furnished. Falkland feels much more intimate, and also slightly more mysterious – if that’s possible! I really love the stories of James IV and V, and their wives. I’m also intrigued by the story of Marjorie Bruce, by whom the Scottish crown came into the Stewart family. What strikes me is that history seems to repeat itself within families – and there’s so much tragedy, at such a young age. Thank you very much for that informative and beautiful post – I’ve always wanted to go there. You’re most welcome Christine, and thank you for the lovely comment! I totally recommend a visit to Falkland, you would love it. Amazing post, Jo! I enjoyed the pictures but I also loved the detailed history! Thank you, Tanara! I am so glad you enjoyed it. Falkland is one of those places that makes you want to return and keep discovering new stuff. I am sure the gardens are beautiful now, too.